Urban Spring Springs into Business! I know this is firmly placed in Fort Greene, but for those of us who head to the park regularly (especially with dogs! ), this place is RIGHT on the way, and has been slated to open for months. I think it'll provide a nice alternative to iced coffee. Inside, the space is small but adorable. Props on the design choice for the ceiling lights! 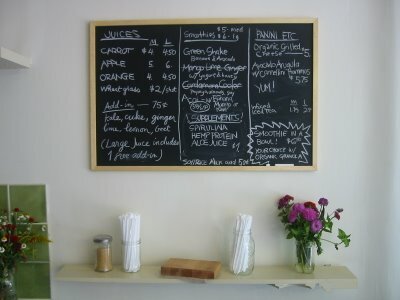 Staff seems supremely friendly and welcoming, which seems fitting for an organic juice establishment. The owners, a husband (Gordon) and wife team, returned to Brooklyn after stints in Afghanistan (he working on Presidential elections and she in drug control). Finding it difficult to go back to 9-to-5 jobs, they decided to go into business for themselves. At first, they concentrated on green building, but when a storefront around the corner from them became available in April, they jumped at it. They didn't want to be "just another coffee shop," and decided to focus on healthy juices and food. I tried the avocado-banana smoothie in a bowl with granola (bowls are partially made from sugarcane and are fully biodegradable). I'm not normally into granola, but whatever they used was completely delish. The only drawback? It set me back $7.04. Totally worth $5, but $7 seemed a bit steep. Then again, the high-ish prices may help pay for organic-natural products and supplies. I had a chance to go into Urban Spring this morning and they must've had a busy opening weekend! Lots of items on the menu weren't currently available. Don't worry -- as I was leaving a delivery of fresh ingredients was being made. I got the Acai smoothie which was very tasty. And Robin's right, the lights are super cool.